Police are appealing for witnesses following an attempted burglary in Tilgate Way, Crawley. 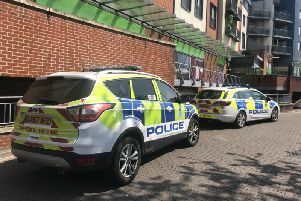 In a statement Sussex Police say that officers were called about 3.45pm on Wednesday (September 5), after a man carrying a metal bar, approximately two feet in length, was seen at the front door of a house. One of the occupants of the house arrived home, at which point the suspect made off from the scene down Garrick Walk. On entering the property, it was discovered entry had been gained and an untidy search had been made, however nothing is believed to have been stolen. The suspect is described as about 5ft 11in, of medium build, dressed in all black clothing, including an Adidas hoody, Adidas trousers and Nike trainers. He also wore a black woollen face covering and black rubber gloves.